Dear Ben, I found your clinic very helpful in many ways. Judging distances, the stroke, the proper grip and etc. I would just like to take the time to say how helpful you clinic has been to both myself and my dear cousin. We both now have similar things that we look out for such as the dimple and positioning. knowing why one would do something as oposed to just doing it really helps. We look forward to continuing this excursion for years to come with the ease and comfort that has been passed down to us from you. Again, thank you for yout time and patience. your knowledge of the game and wisdom with metaphors really helps. Keep doing what you are doing because if your clients see that you love, they will also. Ben, I loved your one-on-one driving lessons that I took last year. My golf game has improved tremendously and friends have definitely noticed! However, I did not get as much out of the group putting clinic, because of a few factors. People kept coming late after the lesson started, you had to repeat things, the group grew too big, then it got dark before I felt comfortable with the lesson details and practice. But overall, I think you are a great golf coach. Thanks a bunch! I have taken your driving lesson and putting lesson in the past two months. I thought you delivered the information very clearly and concise to assist in the learning process of how to learn the game of golf and how to continue to improve. The dimple and positioning has helped in my driving and the approach to putting has made me a better putter. On the average prior to the lesson for putting, I was averaging 3 to 4 putts at every hole. I was out on Oct 29, 2013, and I was averaging 1 or 2 putts on the holes. my Iron play is much better since I started practicing in the mirror. I played a round of nine holes in Mokena, Il and shot a 45 out of a possible 36. By bring my putts down, I was able to score lower than my usual 59 to 70. Thanks for the valuable demonstration and information provided. I am so glad that I have taken your Driving, Putting and Chipping Clinics. My scores have been dropping ever since. My hits off the tee have been more consistent and my short game have improved a lot. I loved your putting clinic. Having the definite “numbers” to work with as opposed to endlessly trying to get “a feel for the putt” made a huge difference to how I approach putting. The instruction to walk off every putt is also a great theory. Thanks so much. “I recently purchased a Groupon for lessons with Ben. I am new to golf and Ben really put me at ease and helped me to realize that I had natural ability. He understands the golf swing really well and is truly passionate about the game. His message is simple, intelligent, and genuine. I look forward to continuing to work with Ben as I try to improve my game next summer”. I thought all of the clinics were great. While I did not take lessons from anywhere else, I cannot imagine any other clinics being more beneficial. The main reason for this is how much instruction you provide at such a low cost. The small group clinics that you run are, in my opinion, even better than individualized instruction because it allows for golfers to get more repetitions on everything that is being taught (and in a longer lesson – 90 minute sessions as opposed to a typical 30 or 60 minute session). If there is any critique that I could make it would be to introduce the proper grip of the golf club earlier in your Swing clinic – in #3 as opposed to #5. While I’m sure your reason for not introducing it until the end is based in sound golf logic using knowledge I surely don’t have, from the perspective of someone like myself, having known that proper grip earlier on when I was learning the basics of the swing could have had some advantages. For example, while I understand that your goals for us are not exactly results-oriented at first, I feel as if had I known the proper grip earlier on, I could have used the results to more appropriately gauge whether I was applying what you were teaching at the time correctly. Overall, though, I really thought the lessons were exceptional. I will definitely reach out to you again early on next summer for a few more to freshen up on my mechanics before I start playing again. Ben, I enjoyed all of your lessons. The one I use most is your putting lesson. It has helped me greatly. I bought some dvd’s of Martin Chuck’s method from Revolution Golf and have found that method more helpful in the driving and iron shots. He basically plays ALL balls off the left foot area and teaches a swing as if you had a hula hoop being held out from your body at a 45 degree angle and striking the ball at the bottom of the hula hoop. I getting there. Playing better than I was at the start of the season. I never got the chance to thank you for the serendipity I experienced on the green after your putting clinic. My confidence has exploded on the green and my scores reflect that. I’ve still got a bit of practicing to do but now I have a routine and no longer quiver over 10 foot putts. I absolutely love pacing off a 50 footer and watching the ball roll just as I imagined. You weren’t kidding when you said you were going to pack it into 90 minutes! I’ve been a golfer for many years but never taken the time to learn to putt. On the green, I was always going for feel because I had nothing else to rely on– until I learned your framework. I am very much indebted to you! Among many other reasons, I was particularly impressed by the progression of the lesson. In the beginning you set us up to fail, stripped us of any pre-conceived notions that we knew how to putt, and then taught us the framework from the ground up. I remember thinking in the beginning, this isn’t going to do me any good- I just don’t get it. And then, as soon as we started putting the pieces together, it all made sense and I’ve never looked back. I think that was one of the most important and impressive parts of the clinic. Thank you for the clinic, Ben! Ben, I do believe you helped my game and will continue in the spring with your lessons. I liked your putting instruction because it was simple and easy to remember. It gave me a guide for distance on each putt, not just a feel. Unfortunately I couldn’t work in the chipping into my schedule this season but looking forward to, as soon as I can. My scores have improved. The chipping lesson definitely helped. This was one of the weaker parts of my game. This lesson simplified this part of the game for me. The putting lesson also helped my game. I have not mastered the methodology but I definitely approach each putt more methodically looking at the break, speed and distance . I need to put more practice time into putting. Ben, thanks for making the game fun again. I walked away for many years, but now have a renewed passion. Your sense of humor…and straight forward method are a great combo. Cheers! I enjoyed and learned from your putting and chipping clinics. I am looking forward to even more improvement next year with additional sessions. The lessons I have learned from Ben have been very helpful. I feel confident walking on the green and making a putt. The straightforward teaching made it easy for me to understand and implement right away. I have seen strokes drop from my score card because of Ben. Thank you. Ben, my game has definitely improved because of your lessons. I have taken your full swing, putting, chipping,and individual training playing 18 holes with you and two other students. I have taken lessons from pros from Odyssey, Cog Hill, Silver Lake golf courses. By far your instructions were the best. I learned a great deal. The difference is that you actually teach a method. Your methods of putting and full swing actually work to improve anyone’s game. I liked your instruction because I think less during my putting stroke, and I have more confidence that I will hit the putt with the correct speed. I was between a 3-4 handicap before your lesson, now I am a 0-2. I make a lot more putts and have more confidence making putts 15ft and under. One of the problems I had, preventing me from shooting par or under, was my putting. I averaged 30-32 putts. I would always think too much about my speed. But, with your way, I know the speed will be right without thinking too much. Since the lesson, I average about 25-28 putts. Granted my chipping has also been better, but I make at least 2-3 more putts, per 18 holes, than before. The last 4 times playing, I haven’t shot over par. Like today, I shot an even par with 4 birdies on 8 GIR. Before, it was hard for me to make more than 1 birdie per 18 because I couldn’t make anything over 5 feet. Since the lesson, I am averaging about 2-3 birdies with confidence that I can make anything under 15ft. 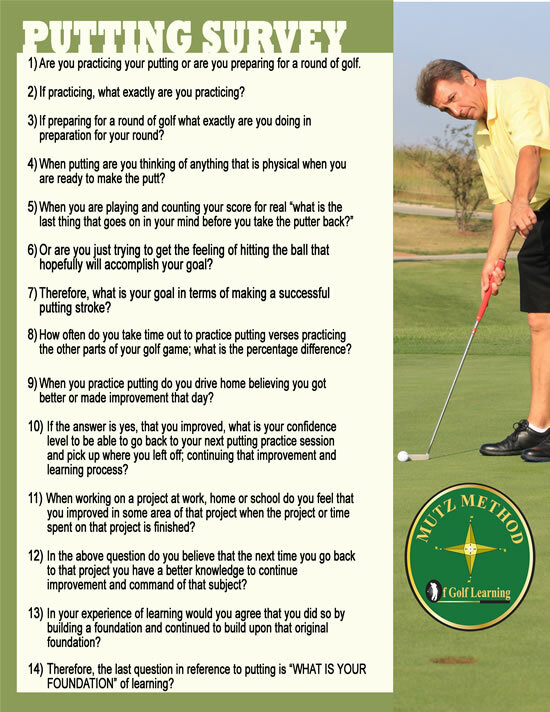 For beginners or grinders who want to take their golf game to the next level AND are wasting strokes on the putting green using a ‘feel’ approach but do not have time to practice, Ben’s putting clinic is a great two hour session that provides you a methodology to become a more analytical and consistent putter, gives you the foundation to improve incrementally each time you find time to practice, and gives you the confidence to shave strokes on the course. In the time it takes to play nine holes on a good day, not only will Ben change how you mentally approach putting, but also he will give an easily repeatable putting stroke that will help you hone your distance control and consistency that removes any vestiges of ‘sight and feel’ putting – a simple ‘reframe’ for me that has made all of the difference. Furthermore, I am already applying concepts I learned in this clinic to other parts of my short game. At this GroupOn price, the value exceeds the cost. I would recommend this clinic to anyone who is serious about improving their golf game by becoming a putting master but don’t have the means or hours to practice as often as you would like to.